Bright in every sense of the word. In 1975, George Lucas was working on pre-production for his next major project, Star Wars. His vision was ambitious, and he wanted top-notch visual effects for it. Shopping around at miscelleneous special-effects houses, Lucas found that no one could offer him the dedication he wanted and a vision to match his own. So he started his own special-effects studio with some of his old college buddies. 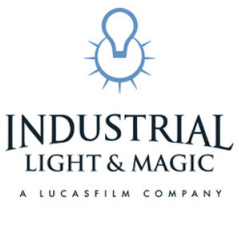 Thus was born the company known as "Industrial Light and Magic." With Star Wars they changed the way special effects were approached. One of their biggest innovations was using computed-programmed cameras that would move around the models and then mimic the same movements whilst in another environment. This would give them space battles that were fast and with effects that made you feel as if you were there. Early on the unions tried to get on the inside of the company and get others employed there, but when the crew demonstrated their home-made computer-controlled camera it became clear no one else in the business knew how to do what they were doing. Ever since, the studio has been on the cutting edge of special effects for movies, television shows and commercials. They've become almost synonymous with Visual Effects of Awesome. The odds are if you see a movie with intensive, elaborate and impressive special effects, ILM was involved with it. They've also helped push the bleeding edge of computer graphics, particularly the use of extensive Chroma Key; 90% of the "sets" in the Star Wars prequels were CGI, and you'd never know it. Pixar itself began as a department of ILM. As of 2009, ILM has received 15 Best Visual Effects Oscars and 23 additional nominations. Do not confuse with OLM Incorporated. See also Studio DEEN and Production Reed, two Japanese studios that also opened up shop in 1975 & Boss Film Studios, Matte World Digital and Tippett Studio, offshoots of ILM. Rango- Netted them their first Oscar for Best Animated Picture. WALL-E - provided CG for the live action scenes. Star Wars: The Clone Wars - Production work only, animation handled by CGCG and Lucasfilm Singapore. Star Wars - Their first major film project. Young Sherlock Holmes - Featured the first ever completely computer generated character. The Abyss - Had the first ever soft surface CG character. These techniques would later see more advanced use in James Cameron's next film Terminator 2. Terminator 2, Terminator 3 & Terminator: Salvation - Judgement Day's T-1000 would be the first instance of a main character being partially computer-generated and all the more awesome for it. Jurassic Park - First instance of CG to create a fully realized creature. There were dinosaurs in the film that never existed as physical objects alongside the actors; they were entirely virtual. Titanic - Some shots of the ship breaking apart. Harry Potter - ILM worked on the first six films in the series, sharing the workload with a number of other companies, but bowed out for the Deathly Hallows films. They did the House Ghosts, the boa constrictor and Voldemort in the first film, Dobby in the second film (as well as the Quidditch matches from here on out, whenever they appeared that is), the Dementors in the third film, the dragon in the fourth film, the Thestrals in the fifth film (as well as the Dementors again), and the Inferi in the sixth film. The second film marks the first use of subsurface scattering, used to create Dobby's skin. Pirates of the Caribbean - Pioneered some pretty stunning iMo Cap for Davey Jones and his crew in Dead's Mans Chest. Avatar - The project was so immense they had to split the workload with Weta Digital and other smaller companies, although ILM was the leader in developing the technology. Howard the Duck - This was the company's first attempt at not only doing a live action adaptation, but also animatronics... It wasn't a success. Somewhat less embarrassing is that it introduced Digital compositing for a few scenes. Death Becomes Her - Their first attempt achieving realistic Human effects via computer. Once Upon a Time In Mexico - Produced the main titles. They were also responsible for several noteworthy commercials for Coke, Energizer, Burger King and Nike amongst others, and (through Word of God), provided the visuals to DreamWorks' Vanity Plate. All CGI Cartoon: Rango. Also did stuff for WALL-E, The Tale of Despereaux, Chicken Little and Star Wars: The Clone Wars. Animation Bump: More than you can imagine. Hey, It's That Guy! : Most people knowledgeable in special effects know who John Knoll or Dennis Muren are. John Knoll co-created the editing software Photoshop with his brother and made some CG ships for Star Trek: Deep Space Nine. Director David Fincher worked there for a few films before becoming a director. Art Vitello, director for shows like Tiny Toon Adventures, The Tick (animation) and Adventures of the Gummi Bears worked as an animator on |Poltergeist. Ken Ralston would go on to establish Sony Pictures Imageworks, responsible for many films like Stuart Little, Cloudy with a Chance of Meatballs and the Spider Man films. Junior MythBusters Grant Imahara and Tory Belleci, as well as Adam Savage, all worked there at different points in time. A group of ILMers appeared (and won) on Junkyard Mega-Wars. Off-Model: Occurs in Revenge of the Fallen three times and Dark of The Moon once. explained in more detail on the page. One of Us: Several employees are Transformers fans. Off-the-Shelf FX: The Death Star trench in A New Hope was constructed from battleship models. In The Empire Strikes Back, you can catch a glimpse of a Potato and a shoe during the asteroid field sequence and the TIE Bombers wings were taken from model kits of Darth Vader's TIE. This page was last edited on 20 October 2018, at 01:13.